Gay Prague Events 2019 Prague hosts range of events throughout the year. Prague hosts a wide range of events throughout the year. 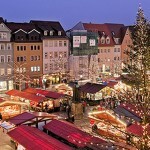 The city is famous for both its Easter and Christmas markets together with international gay events such as Pride in August and the popular International Gay Film Festival in November. Prague Gay Pride is a week long festival of concerts, lectures, parties and events culminating in the official parade on the last Saturday of the weekend, normally the second weekend in August. The Christmas market in Prague is a must do during the festive season. The two main squares (Old Town Square & Wenceslas Square) are transformed into a winter wonderland that St Nickolas himself would be proud. The 1st of every month sees the O.M.G party held at Klub Mecca, each Month has a different theme with top DJ and some of the hottest Go Go boys in town.